HELP END THE DOG MEAT TRADE! Each year, tens of millions of dogs are farmed or stolen, and then slaughtered for food throughout parts of Asia. In Korea, popular myths claim that a tortuous and painful death enhances the taste of the meat and the sexual "stamina" of the men who eat it. 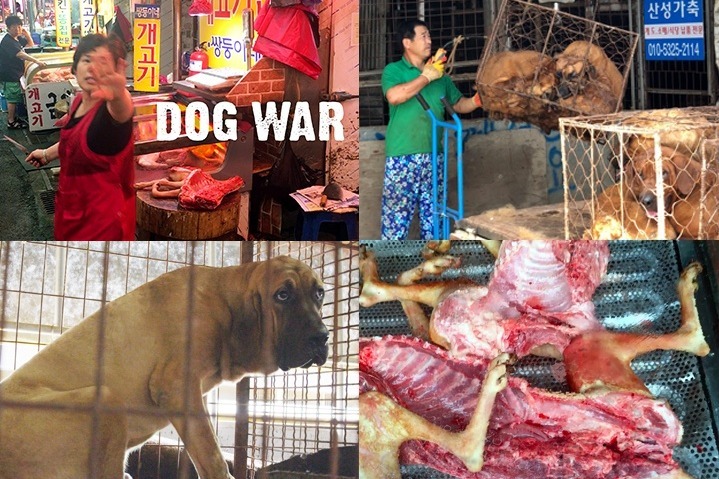 Welcome to the hidden world of the dog meat trade – a practice that has become a flashpoint in South Korea, where some believe the Asian custom originated, and where cultural and generational shifts have drawn entrenched battle lines. Enter a team of American special ops vets who join forces with Korean activists and employ commando practices to stop this lucrative and powerful industry. Working mostly undercover, they enter and disrupt the shadow world of the dog meat trade, saving one or hundreds of dogs at a time, and help to transform an industry and country. Leaving behind families and critics that question their motives and tactics, the vets risk it all to fight for those that cannot fight for themselves – dogs brutally tortured for human consumption. Directed by Andy Abrahams Wilson (the filmmaker behind the Oscar-semifinalist Under Our Skin ), Dog War goes behind the scenes as the battle unfolds, looking at the complex forces that pit dogs' lives against human livelihoods, and revealing haunting truths about the breach of contract with man's best friend. Watch the trailer above and share it with others! In Korea alone, the cruel dog meat industry commits purposeful, intentional torture, inhumane killing, theft of family pets and a multitude of other abuse and neglect to an estimated 2-3 million dogs each year. The only way to stop this practice is through education and spreading awareness around the world. And it’s working. Dog meat consumption is in decline due to the work of activists at home and abroad. With a team of award-winning, veteran filmmakers at the helm, Dog War will leverage gripping non-fiction storytelling to raise broad-scale, international awareness of the dog meat trade so that we can finally put an end to these inhumane practices. Please join us in educating audiences around the world by donating to the completion of the documentary. Together, we can stop the cruelty and torture of millions of dogs. After three production trips to Korea, we have completed principal production, and now need funds to edit. We've been fortunate to get this far with many small donations and a few larger ones, as well as in-kind services and reduced rate fees. With your help, we will be able to edit our roughly 80 hours of footage into a compelling narrative that will reach the hearts and minds of millions. Our funding goal of $10,000 will enable us to hire an editor and begin the months' long editing process. After this, we'll be unstoppable. Your tax-deductible contribution, large or small, brings us closer to finishing the film – and to mainstream visibility of the hidden horror facing dogs in South Korea. So that we can complete the film with the urgency it demands, we're looking for select donors who have the capacity to make a greater impact. For a $500 contribution, you will receive On Screen Credit in the completed film. We have other giving thresholds to receive honorary Associate Producer and Executive Producer credits. If you have questions about how this works or would like additional information, please email us directly at mail@openeyepictures.com. Open Eye Pictures is a non-profit, public benefit corporation under section 501(C)(3) IRS code. All contributions are tax-deductible to the extent of the law. Equally important, we hope you will join the Dog War team as an ambassador and help spread the word about our film and funding campaign. Please share this GoFundMe campaign on social media with friends, family, animal rights activists, and anyone you think might be interested. Open Eye Pictures is a multi-award-winning, non-profit organization specializing in the production and distribution of creative, educational media. We open the eyes and minds of viewers to see the extraordinary in the ordinary and the bigness in the littlest of things. We turn the lens on places where worlds and assumptions collide, encouraging compassion and action, and moving audiences in unexpected ways.